As we approach the festive season I am feeling very nostalgic because this year I will not be visiting my family in Mauritius over the festive period. I will miss them all so much but hey that’s life, like my dad would always say no matter whether you are far or close it’s all about being firm to your commitment and this year my work commitment takes over. Instead of flying to Mauritius I thought of sharing some of my fond memories while you travel with me. Let’s talk about Xmas Spirit in Mauritius where the heart lies. Ile Maurice being a tropical island we are used to enjoying Christmas celebration in a summery hot weather of plus ºC. Tropical fruits are at their best, mangoes, litchis; longan (dragon eye fruits), sweet small pineapple, watermelon and many more including several citrus fruits. Living on such a tiny island we are blessed not just by being surrounded by beautiful landscapes but also being able to experience some of the most delicious food. If you are planning to visit the island over the festive period you will have the privilege to experience Christmas on the tropical Island and tasting Mauritius multicultural cuisine. My memory of Christmas in Mauritius still resounds in my eyes and my heart, seeing lively shops, street markets selling toys, firecrackers, clothes, balloons as they fill the street with such a buzz until late evening. Many would think here she goes again the crazy girl Ice-Cream at Christmas!!!! in this cold wintery weather. But I am feeling the nostalgia while I think of summer in Mauritius talking about seasonal ice-cream was indispensable. Let’s travel to home Island Mauritius and be merry. I know mangoes are in full bloom in Mauritius at the moment, and I also know it is the kind of fruit that many absolutely adore. 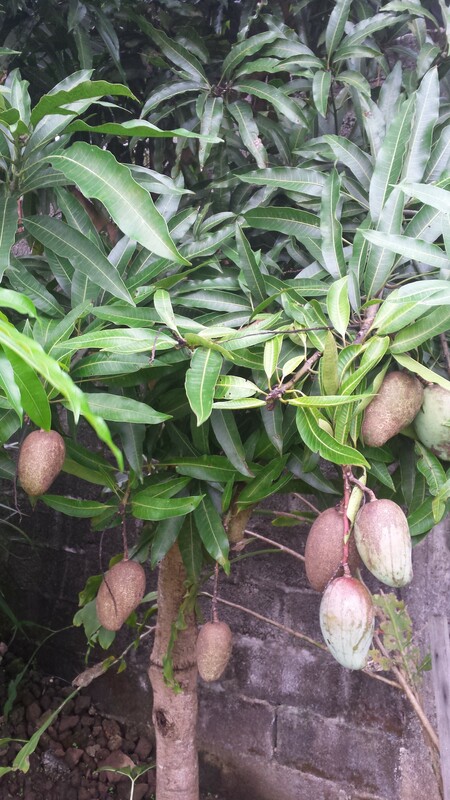 It was one of my papa favourite fruit; he would munch away all the time when they were in full season. Having tried this ice-cream several times and loving it my pleasure to share it today as it’s a special day. Like most people I do like a good creamy ice-cream but I must admit I prefer egg free ice-cream anytime. I have recreated this flavor from one of my old recipe – and woooow this is totally scrumptious. Making homemade ice-cream has always been on my bucket list of recipes to create and try out and to try out different flavours too. Despite having an ice-cream maker I must admit I don’t use it as much as I intended to use it, instead I have been making no churn ice-cream all throughout last summer. It is so easy that I have NOT bought any ice-cream last summer. 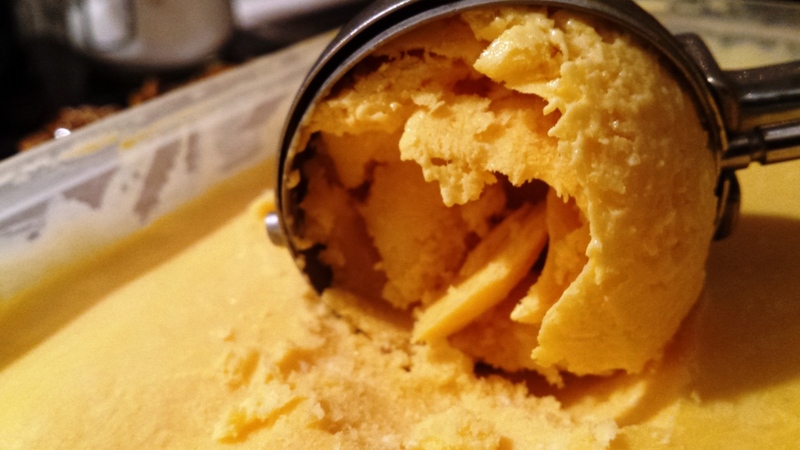 This is a no-churn, eggless ice cream that can be made in no time using a mixer. The first time I made it I was overwhelmed by how easy, simple it was the ice cream is rich, creamy and outrageously good! Yet so simple to do. 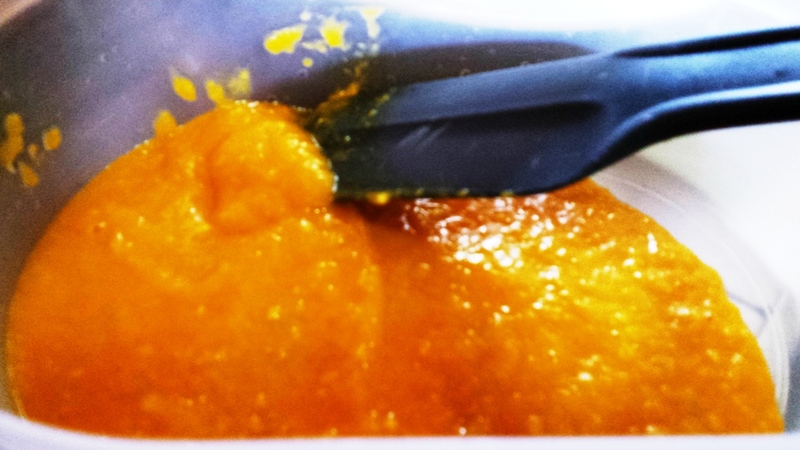 Peel, stone and place the mango flesh in a blender, puree to smooth paste, keeping aside. In a bowl add the double cream whisk until thick, empty the evaporated milk into the cream mixture, add sugar to taste. Using a hand mixer blend till well combined. Taste and add more sugar if needed (Remember once food is frozen it tends to reduce the sweetness of a dish therefore do taste the creamy mixture and adjust as necessary). Add the pureed mango and mix well. Pour the ice cream mixture into a freezer safe bowl. Cover and freeze for 1-2 hours till the edges begin to freeze (I leave mine overnight, leave to stand on the counter for ten minutes before attempting to whisk again). After 2 hours take the ice cream out, put it back into the bowl and whisk till creamy and return to the freezer bowl. You can repeat steps 2 & 3 times, but I find this is not necessary. I tend to do this process only once and end up with a very creamy ice-cream. To serve let the ice cream stand on the counter-top for 3-4 minutes before scooping and serving. 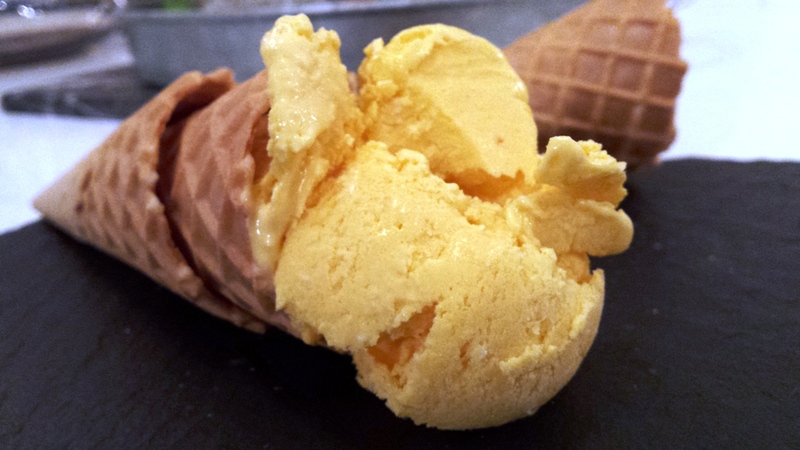 Serve with on cones or a few scoop topped with fresh chopped mangoes or sweet mango puree. Brinda’s Note: Condensed milk is a great ingredient when making no-churn ice-cream, it’s really creamy and smooth but as you noticed I used evaporated milk instead and trust me it’s just as creamy with less sugar – you can use either one of them. Do give it a try and experiment of flavours! I can guarantee you will no doubt impress yourself and your guests.